Dallas-based trial law firm Sayles Werbner teamed up with the Mary Kay Foundation in May to help raise money to eliminate cancers affecting women and end the epidemic of violence against women. 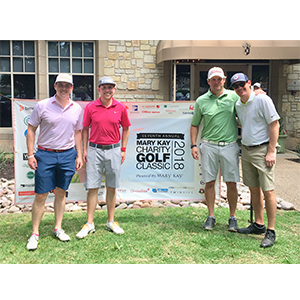 As a sponsor of the 7th annual Mary Kay Charity Golf Classic, Sayles Werbner is proud to be a part of the of the Foundation’s mission of raising funds and awareness for organizations fighting cancer and violence against women. Pictured left to right: Richard Gray, attorney at Koons Fuller, Trevor Domlovil, Sourcing Manager, Global Procurement and Supplier Development at Mary Kay Inc., Sawyer Neely and Sam Acker, attorneys at Sayles Werbner.